When food truck builders get the green light from their customers to begin fabrication, the timeline clock begins. The need for a reliable source for the right step vans specifically for food truck build-outs is critical. This is where the leading nationwide step van dealer for food trucks steps in and understands the sense of urgency. To reduce the amount of stress on the food truck builder, MAG Trucks has the largest selection of new and used step vans on our lot, ready to go at any time. MAG Trucks ensures our process is easy, straightforward and quick. Our step vans can be delivered nationwide within 7-14 days. In addition, MAG offers an unmatched warranty with service stations nationwide for convenient service. MAG has over a decade of experience working with food truck builders, so let’s learn more about their process! Know what you’re looking for… gas vs. diesel, your customer’s price range, year, mileage, engine size, etc. When choosing a step van for a food truck buildout, it’s important to know the specifications of what your customer wants and how your fabrication team will complete the buildout. For the budget-conscious food truck customers, MAG Trucks has the largest fleet of used step vans on our lot – ready to go. From Freightliners in the early 2000’s to low-mileage 2015 step vans, MAG Trucks updates our inventory daily and has over 50 used/reconditioned trucks ready to be delivered to you nationwide within 7-14 days. RELATED: Listed on blogger.com’s article “Top 10 Step Van Dealers, FedEx Box Trucks & Custom Food Truck Dealers,” MAG Trucks is among the top dealers across the country. Click here to review the full list. Financing Options Available Before continuing much further, it’s a good option to secure financing, if needed. 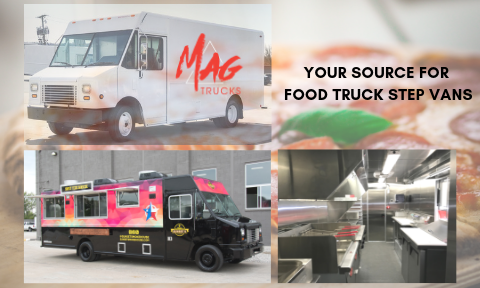 MAG offers competitive rates, quick turnaround and approval notification to our nationwide food truck builders, resulting in an influx of repeat purchases over the years. Get started on the financing aspect by completing the Credit Applicationand get the approval process started. Selection, Selection, Selection MAG’s selection of new and used step vans makes it an easy choice for so many of the food truck builders. We pulled a list of the top food truck fabricators from across the country as a resource for those entrepreneurs, restaurant owners, caterers, existing food truck owners, or larger brands needing to find the right fit. Most of the fabricators on this list purchase their step vans from MAG Trucks!